More than a century of conventional oil drilling has depleted much of the easy to access oil across California’s south central coast. Now, Santa Barbara County is facing a massive increase in onshore oil and gas production using much dirtier and more dangerous extraction methods known as cyclic steam injection and steam flooding. 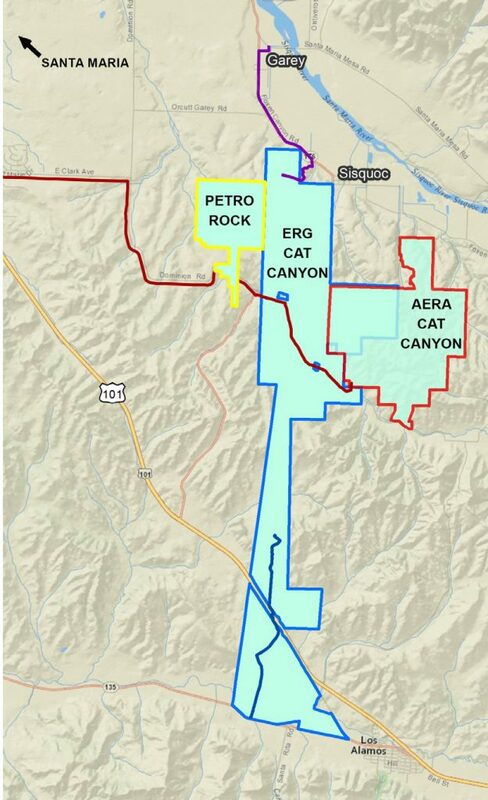 If approved, these three projects proposed by ERG, Aera Energy, and PetroRock would bring more than 700 new oil wells in Cat Canyon located about 10 miles southeast of Santa Maria. All three projects depend upon the use of thermal enhancement techniques, including steam injection and steam flooding, to extract the heavy, viscous crude oil located at depths ranging from 2,000 to 5,000 feet below the surface. These extremely energy-intensive methods involve super-heating enormous amounts of water to around 500 degrees, pumping it underground at high pressure to loosen the oil which is then sucked up to the surface. Drilling deeper and deeper into the Santa Maria Groundwater Basin is extremely risky, particularly given that these enhanced oil drilling techniques threaten the County’s precious groundwater resources. Surface water in this area drains into the Sisquoc River or flows out to sea from the San Antonio Creek. Cat Canyon is an agricultural region with rolling hills used for cattle grazing, vineyards, and other farming operations. It hosts native oak woodland, coastal scrub, annual grassland, and sensitive species afforded special protection by the California Department of Fish and Wildlife. Cat Canyon also is home to the towns of Sisquoc and Garey in which people live, work, and recreate. Toxic air emissions, oil spills, oil seeps, and other sources of soil and water contamination from these three proposed projects pose serious risks to public health and safety, and undoubtedly will cause severe impacts on the immense natural resources and important agricultural operations currently in Cat Canyon. On behalf of our client, Sierra Club Los Padres Chapter, EDC will continue to participate throughout the application and environmental review process concerning these three dangerous proposals, working to convince the County to deny the projects and instead focus on a clean energy future. Project status: The Draft Environmental Impact Report was released on June 4, 2018. The public comment period is now closed, and we are awaiting a proposed Final Environmental Impact Report. You can read EDC’s comments on the DEIR here. The County released a proposed Final EIR in February 2019, and held two Planning Commission hearings in March. Project status: The County’s Draft Environmental Impact Report for public circulation and comment was released on November 30, 2018, and the public comment period ended January 28, 2019. Project status: The County is currently working to complete a Draft Environmental Impact Report for public circulation and comment. EDC submitted scoping comments in July 2018. Printable factsheet on all three projects [English] [Spanish].